It’s pretty much that. 2007 with a minibot. Why fix what ain’t broke, right? Another great evil machine. Although I’ll only be seeing this beast on Saturday morning without MORT, I’m glad both 11 and 25 are going to Virginia . Good luck Wayne and company, not that you’ll need it. For once I guessed right about you guys during week 1. Where did you get your coiled pneumatic tubing?? Or did you coil it yourself and how?? Hey I think you lost 2 wheels In all seriousness looks good guys. Good Luck! If it wasn’t for the PDB, I really would just think this was your 2007 bot. I thought this thread was a joke until I saw the new radio and battery. The tread on those wheels seems a little worn off (given the fact that this might be their practice robot). 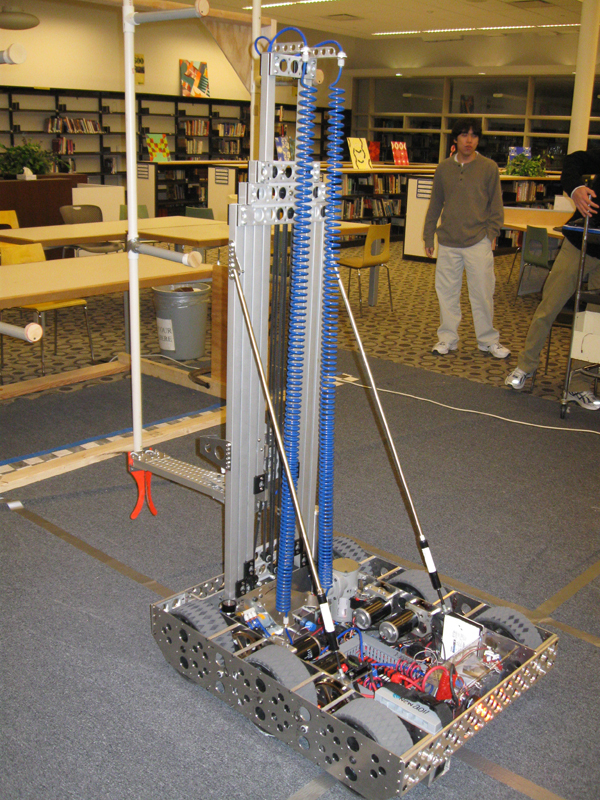 2007 game involved climbing up other robots (ramps), this chassis was designed to climb ramps hence the angle in the front. They probably slapped on legal electronics to drive around that robot. … I wouldn’t be surprised at all if their 2010 robot looks exactly the same with a minibot. Even though this looks similar, everything has been redesigned from scratch. If the webcast runs / if you see it in person, you will notice significant differences in the way it performs. This can’t be their 2007 robot as it only has 6 wheels. I’m curious to see what improvements they made… if any. Even as early as 2004, our bases have a 45* cut at the front and back with just enough room to cover the wheels. This is done to preserve structural integrity and save weight. 3 & 4. 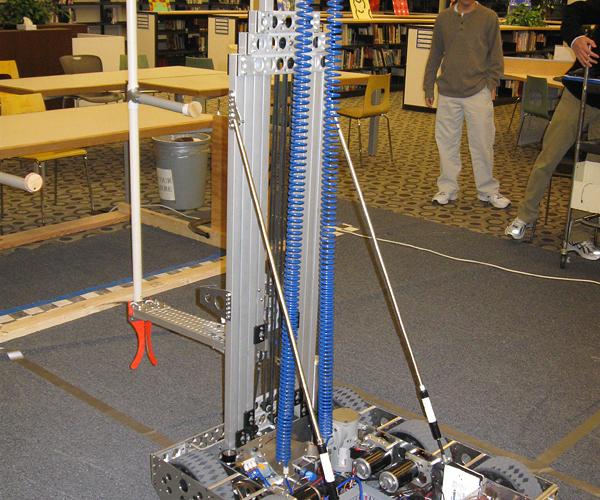 It seems like you are accusing us of using our “practice” 2007 robot instead of building a new one :eek: . We did not have one. Don’t worry - a surprise awaits you at the Florida regional. The lift on this thing is insanely quick. Just watched on the webcast. I was not accusing your team. I assumed that team 25 will not post an actual picture of the robot before their regional not realizing first week of regionals starts today. … Can’t wait to see Evil Machine’s twin at Florida. (Assuming again… not accusing… just clearing it up). I know… It’s very obvious for anyone who has tuned into the NJ regional webcast. Their driveframe in 07 also used large rectangular tubing versus the current plate setup. man, those are some big gears on that drivetrain! snide remarks about it looking similar aside, that is a nice robot! Good luck tomorrow and Saturday!